The construction and maintenance of model-to-model and model-to-text transformations pose numerous challenges to novice and expert developers. A key challenge involves tracing dependency relationships between artifacts of a transformation ecosystem. This is required to assess the impact of metamodel evolution, to determine metamodel coverage, and to debug complex transformation expressions. 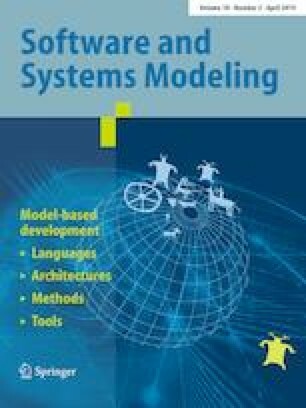 This paper presents an empirical study that investigates the performance of developers reflecting on the execution semantics of model-to-model and model-to-text transformations. We measured the accuracy and efficiency of 25 developers completing a variety of traceability-driven tasks in two model-based code generators. We compared the performance of developers using ChainTracker, a traceability analysis environment developed by our team, and that of developers using Eclipse Modeling. We present statistically significant evidence that ChainTracker improves the performance of developers reflecting on the execution semantics of transformation ecosystems. We discuss how developers supported by off-the-shelf development environments are unable to effectively identify dependency relationships in nontrivial model-transformation chains. Communicated by Prof. Lionel Briand. This work was supported by The Killam Trust, NSERC (the Discovery and the IRC program), the GRAND NCE and IBM Canada. The development of PhyDSL was supported by the AGE-WELL NCE. We would like to thank Kelsey Gaboriau and Vina Nguyen for their support during the development of ChainTracker. We would also like to thank Kelly Garces for her generous help during the execution of this study. What ATL script contains the “Trigger2Button” rule? In Mockup2GUI.atl, what transformation rule contains the binding expression isMain<-mockscreen.main.toString().endsWith(“true”)? What metamodel elements are used in the creation of the GUI!Application element? What metamodel elements are created using the Mockup!TriggerSection element? Considering the entire transformation chain, what metamodel elements does the template line 24 in generateControlles.mtl depend on? What template lines in generateControlles.mtl are used in the generation of line 21 in PlayerActivity.java? Considering the entire transformation chain, what metamodel elements does the generation of line 4 in login.xml depend on? Considering the entire transformation chain, what metamodel elements does the generation of line 34 in AndroidManifest.xml depend on? What files does the generateControllers.mtl template generate? What files does the generateViews.mtl template generate? What metamodel elements are used in the creation of the GUI!Screen element? What metamodel elements are created using the Mockup!ScreenSection element? What metamodel elements are created using the property “name” of the Mockup!Screen element? Considering the entire transformation chain, what metamodel properties does the generation of line 17 in login_activity.xml depend on? Considering the entire transformation chain, what metamodel elements does the template line 19 in generateViews.mtl depend on? What template lines in generateControllers.mtl are used in the generation of line 37 in LoginActivity.java? Are there any unused elements in the Mockup metamodel? If so, which ones? Are there any unused elements in the GUI metamodel? Considering the entire transformation chain, what metamodel elements does the generation of line 14 in AndroidManifest.xml depend on? Considering the entire transformation chain, what metamodel elements does the generation of line 38 in LoginActivity.java depend on? Considering the entire transformation chain, what metamodel elements does the generation of line 14 in login_activity.xml depend on? Considering the entire transformation chain, what metamodel elements does the template lines 41–44 in generateControllers.mtl depend on? What metamodel elements are created using the property “fromScreen” of the Mockup!Transition element? Considering the entire transformation chain, what metamodel properties does the generation of line 8 in login_activity.xml depend on? What template lines in generateViews.mtl are used in the generation of line 27 in AndroidManifest.java? What ATL script contains the “Effect2Action” rule? In Game2Layout.atl, what transformation rule contains the binding expression isBall<-r.actorDefinition.first().isBall.boolean.solveBool()? What metamodel elements are used in the creation of the Scoring!TouchRule element? What metamodel elements are created using the PhyDSL!Coordinate element? Considering the entire transformation chain, what metamodel elements does the template line 148 in generateDynamics.mtl depend on? What template lines in generateScoring.mtl are used in the generation of line 102 in ScoringManager.java? Considering the entire transformation chain, what metamodel elements does the generation of line 100 in ScoringManager.java depend on? Considering the entire transformation chain, what metamodel elements does the generation of line 220 in DrawingHelper.java depend on? What files does the generateLayout.mtl template generate? What files does the generateGraphics.mtl template generate? What metamodel elements are used in the creation of the Scoring!CollisionRule element? What metamodel elements are created using the PhyDSL!Ends element? What metamodel elements are created using the property “name” of the PhyDSL!Actor element? Considering the entire transformation chain, what metamodel properties does the generation of line 76 in ScoringManager.java depend on? Considering the entire transformation chain, what metamodel elements does the template line 110 in generateScoring.mtl depend on? What template lines in generateLayout.mtl are used in the generation of line 264 in PhysicsView.java? Are there any unused elements in the PhyDSL metamodel? If so, which ones? Are there any unused elements in the Dynamics metamodel? If so, which ones? Considering the entire transformation chain, what metamodel elements does the generation of line 141 in MainActivity.java depend on? Considering the entire transformation chain, what metamodel elements does the generation of line 29 in ControlManager.java depend on? Considering the entire transformation chain, what metamodel elements does the generation of line 281 in PhysicsView.java depend on? Considering the entire transformation chain, what metamodel elements does the template lines 104–108 in generateControls.mtl depend on? What metamodel elements are created using the property “value” of the PhyDSL!BooleanType element? Considering the entire transformation chain, what metamodel properties does the generation of line 18 in ControlManager.java depend on? What template lines in generateControls.mtl are used in the generation of line 99 in ControlManager.java? See Tables 5, 6, 7, 8, 9, 10, 11, 12, 13, 14, 15, 16, 17, and 18.